Think and Do the Extraordinary is more than a motto — it’s what we do every day at the NC State College of Veterinary Medicine. And it saves lives. 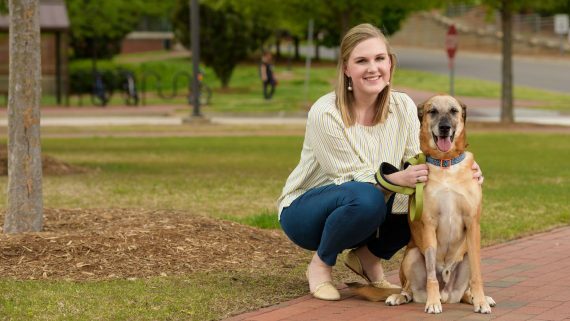 Just ask Hannah Adams of Durham, the owner of Bear, a 6-year-old German shepherd mix. In January, Adams noticed a swelling between the left side of Bear’s nose and eyes. Sometimes his teeth would chatter as though he was cold. A local veterinarian diagnosed Bear with an abscessed tooth and he was treated with antibiotics. When that failed to resolve the condition, Bear was referred to a local dental vet who recommended removing the tooth. But once the procedure began, Hannah was told that it was not abscess, but possibly oral cancer. 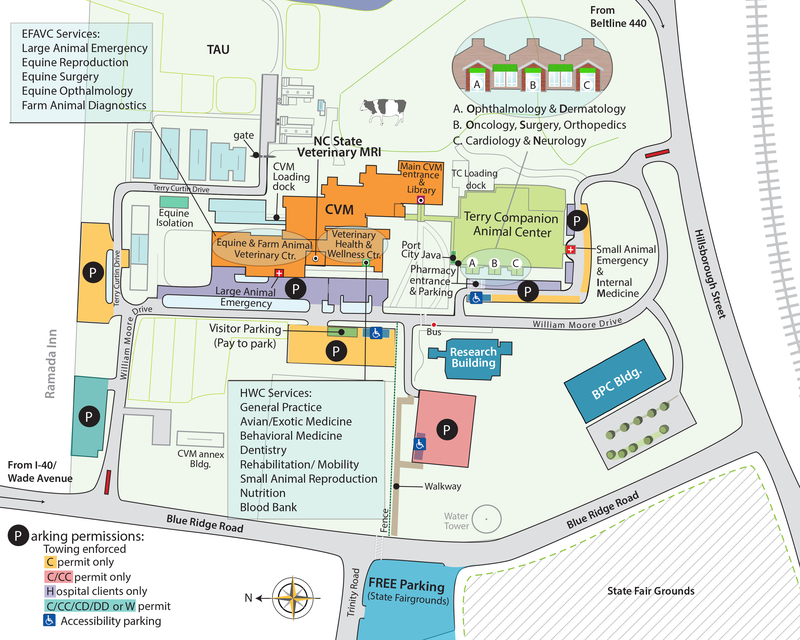 Bear was eventually referred to the NC State Veterinary Hospital where he was first seen by Mike Nolan, assistant professor, radiation oncology and biology. After a thorough diagnostic process, Bear’s cancer was identified as a “HiLo” fibrosarcoma, identified as a form of fibrosarcoma, a cancer of the connective tissue. While fibrosarcoma is aggressive and can recur, it generally does not spread to other parts of the body. Hannah Adams with Bear, a 6-year-old German shepherd mix. 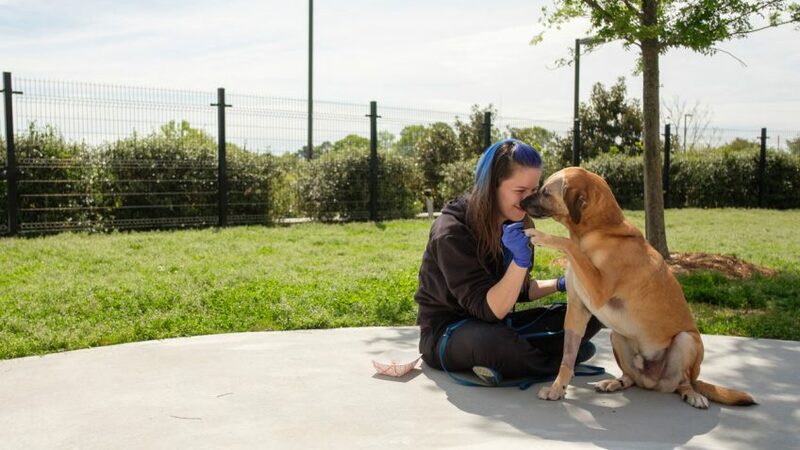 The recommended treatment was surgical removal of Bear’s tumor, followed by full-course radiation therapy, 18 to 19 daily treatments over a three-week period. While Adams felt more hopeful about Bear’s prospects and was willing to devote the time required to get the recommended treatments, the financial commitment was daunting. That’s where the Petco Foundation came in. The organization is committed to making cancer treatment for companion animals more accessible for pet owners like Adams. The aim is twofold: putting cancer treatment within the reach of more pets and their owners advancing the science of veterinary medicine through treating more cases of cancer in pets. Through a grant to the NC State College of Veterinary Medicine, the Petco Foundation helped make Bear’s treatment possible for Adams. In April, Bear’s surgery was performed by Valery Scharf, clinical assistant professor of small animal soft tissue surgery. Scharf carefully excised the tumor while getting clear margins in the surrounding tissue to reduce the probability of the tumor’s return. To get the clear margins, Scharf removed a portion of bone in the nasal cavity and part of the adjacent upper jaw, including six teeth. Radiation helped to sterilize the margins. Scharf says Bear’s prognosis is good and his final radiation therapy treatment was June 21.